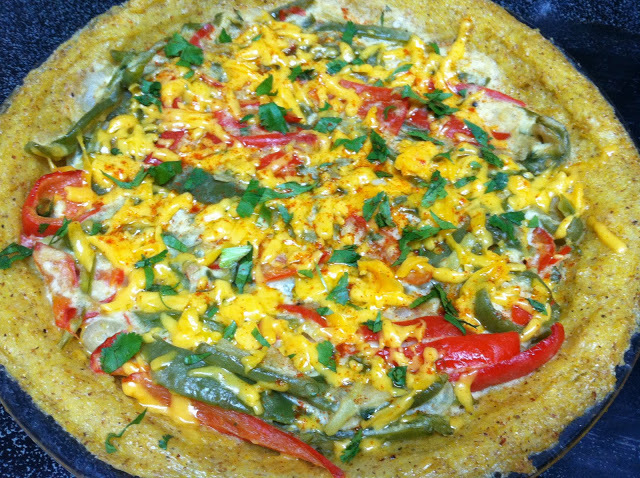 The vegetable drawer is stuffed with bell peppers, and I wasn’t sure what to do until I had a spark: Moosewood’s Polenta Pie Crust meets the Mexican Casserole, and mates. Here is the Cayugan born baby. This is great served hot or cold! You're colleagues will be impressed with your lunchbox. Put 2 cups of water on the stove and bring to a boil. Meanwhile, combine cornmeal, salt and cold water in a small bowl. Add the mixture to the boiling water and stir consistently for about 10 minutes until very thick. Remove from heat and cool. (I transferred the mixture to a platter to cool). Preheat oven to 375, and grease a 9 or 10 in. pie tin or pyrex with olive oil. 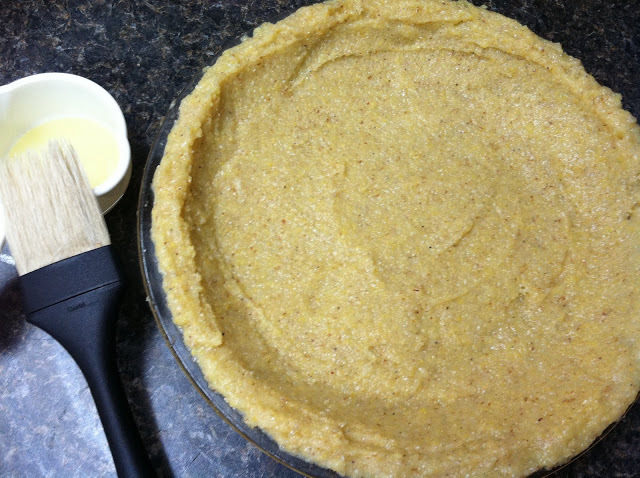 When cornmeal is cool, spread in the pie tin with a wet spatula or wet hands - it's sticky! Spread about 1/2 in. thick. Brush the surface with olive oil. Bake uncovered for 40-45 minutes. Add 1 tbs. of olive oil to a heated pan, and saute onions, garlic, and peppers in that order. Mix all spices except the paprika in a small bowl, and add to veggies with flour and 1 tbs. of olive oil. Stir and cover until cooked. Beat the egg and mix with yogurt. Add to pan and stir. Mix in half of the cilantro Fill the pie crust with the contents of the pan, and bake for approximately 25 minutes at 350. Test with a toothpick for doneness. If it comes out clean, take the pie out of the oven and sprinkle with remaining cilantro, cheddar, and paprika. A few notes for the pie crust: - You might not use all of your cornmeal. I didn't use about 2/3 of a cup - save for later recycling! - I expected the crust to be, well, crusty. It is not. 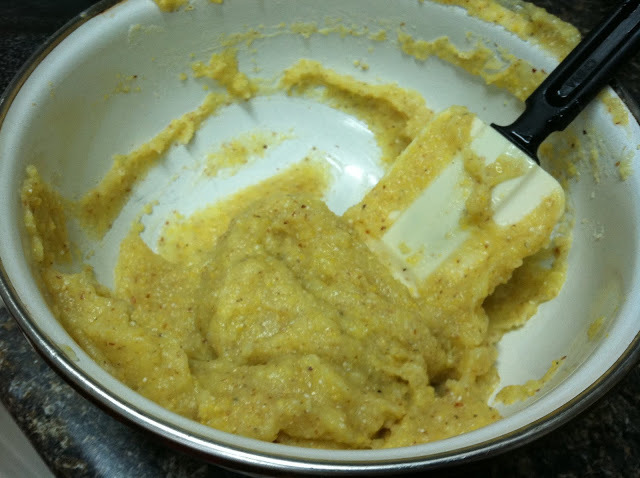 This is polenta and I think some other agents are needed to create a crunchier harder crust. - My oven gets steamy, so I had to lower the temperature a bit because at one point my crust started to boil!